As the Christmas party season sets in, so too does that all-important search for a special experience that’s guaranteed* to deliver the most memorable package possible. But as we know, finding an event that’s perfect for friends and family or even work colleagues can be as tiring and emotionally trying as wrestling an elf. Thankfully, just like Santa, tried and tested solutions really do exist! Christmas offers an abundance of comedic highlights, but few compare to the spectacle that’s on show at the centre of Camden Lock Market. In terms of entertainment, the Highlight Club is something of a national treasure. With fully booked venues across the UK, it’s hard to argue with the company’s proven appeal, but it’s Camden that really knows how to get the party started. With the availability of bronze, silver and gold packages to choose from, your otherworldly Highlight experience is sure to leave you awe-struck. 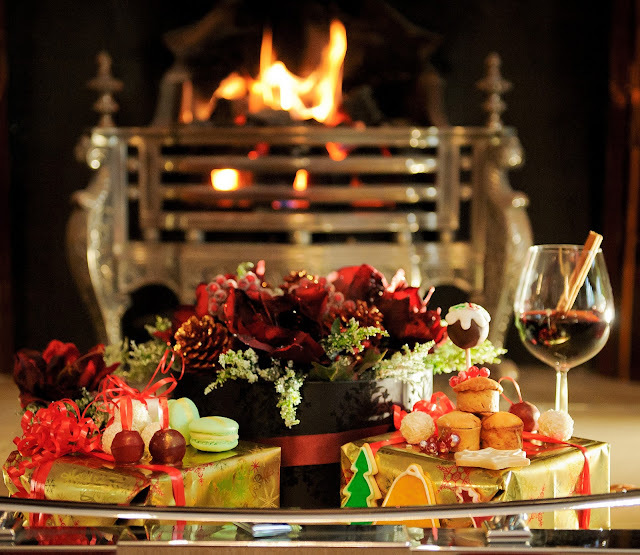 You can wine, dine and have a whale of a time at any old Christmas shindig, but exclusive VIP packages are available and bespoke packages can be arranged at Highlight, so whatever your requirements you can get them down on your wish list. Like so many comedy marvels including Alan Partridge’s Mid Morning Matters, Camden’s Comedy Christmas Party is sponsored by our fun-loving friends at Fosters, a brand that really know how to pack the Christmas punch. Fans will already be familiar with their infamous and refreshingly funny videos that feature far more than a fistful of festive spirit in the 2012 countdown to Christmas day. Both established and up-and-coming comedians feature at Camden’s 2012 Comedy Christmas Party, including Curtis Walker, David Ward, Geoff Norcott, Gina Yashere, Ian Moore, JoJo Smith, Kerry Godliman, Kevin McCarthy, Mark Maier, Mike Gunn, Nick Page, Pete Johansson, Phil Nichol, Roger Monkhouse, Sean Meo, Stefano Paolini and Steve Gribbin (to name but every last one of them!). With such a dynamic display of comedic talent on offer, you can rest assured that all tastes are catered for. So if your idea of comedy cuisine and claret roughly translates into laughs, lobster and lager, there’s something for everyone, whether they’re suave and sophisticated, strange and savage or even snow-covered and Santa-shaped! With a number of Camden comedy nights on offer throughout December 2012, booking the right dates for your party should be a (cold wintery) breeze. Ron Burgundy (in Anchorman) said: “I don’t know how to put this, but I’m kind of a big deal”. I’m not going to lie, I sometimes have that same mentality. So imagine my usual disappointment when, on entering the bars and nightclubs of London, I don’t get treated like the big deal I feel I am when I’ve got my full face of make up and little black dress on. Where are the admiring glances? The people wanting to talk to me? The hordes of men at my stilettoed feet? Stepping out of the party bus at the opening launch of the new Adventure Bar in Clapham, I got the reaction I’ve always wanted. Photographers crowded around the door of the bus, trying to get a sneaky snap of us as we piled out and assembled on the red carpet. As we queued outside (clutching VIP tickets under our coats), photographers continued to take our pictures while a crowd of screaming females (okay, members of Adventure Bar staff) surrounded us. Now that was an entrance. I’m a fan of the Adventure Bar chain. There are currently four different bars around the capital – in Covent Garden, Clapham Junction, East Dulwich, and now Clapham High Street – and each one is slightly different from the other. The Covent Garden bar is the closest to me, and I go there monthly with my girlfriends to drink cocktails and dance on the tables. But I’ll be changing my route and be going home via Clapham as of now. The new Adventure Bar is trendier than the other three, with a New York-style exposed brick loft feel. It’s more daring, with tongue-in-cheek cocktail menus contained within risqué old-school VHS covers. There’s a new food menu and a refreshed and exciting cocktail selection. I hadn’t realised it before, but the Adventure Bar chain needed a facelift, and a facelift it got. The Clapham High Street venue is the younger, hotter, sexier sister that you slink off to meet whenever possible. My favourite of the new cocktails is the Lemon Cheeseshake Martini. It’s essentially pudding in a glass. With a salted biscuit rim and a whole load of mascarpone cheese, it’s the naughtiest and most satisfying cocktail I’ve probably ever tasted. If I wasn’t so concerned about early heart disease/fitting into my tiny black dress for the work Christmas do, I’d have ordered enough of the lemony cocktails to bathe in. Another stand out cocktail is the Morning Glory, a tequila and lime based cocktail served in a saucepan and decorated with mozzarella and chorizo on a cocktail stick. Now, I’m not sure about you, but that is better than any greasy fry up. Okay, so I’m not really that much of a big deal. But the words of Ron Burgundy have never been so fitting than when applied to the new Adventure Bar on Clapham High Street. I don’t know how else to put it, it’s kind of a big deal. 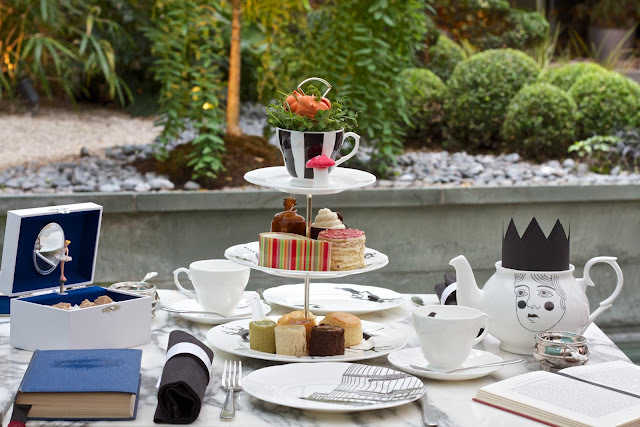 Although not strictly speaking a yuletide afternoon tea, there is more than enough magic and whimsy at the Sanderson’s Alice in Wonderland-themed tea (pictured above) to secure its place in our festive countdown. 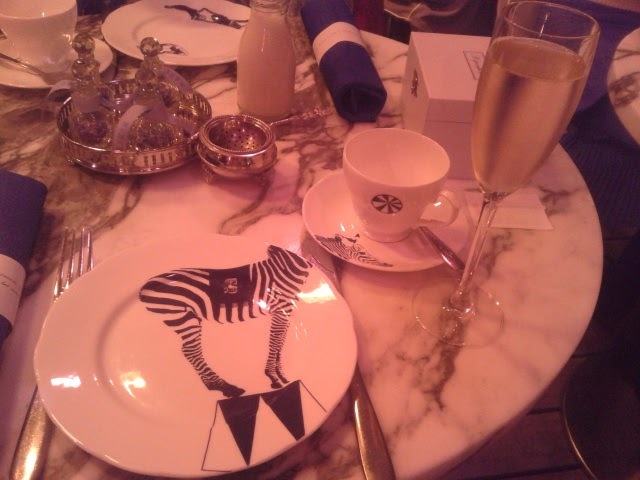 A riddle straight from the Cheshire cat’s mouth, is wrapped around each napkin and menus are vintage books with tea details in the middle. This attention to detail is thanks to the hotel’s collaboration with Shoreditch based design collective Luna and Curious, where as much effort has been put into the crockery and tableware as the food and tea. Card deck king and queen teapots, trapeze artist, zebra and birdcage teacups, side plates, and carousel-design cake stands are all great fun. Sugar cubes are served in musical jewellery boxes, complete with a ballerina twirling to ‘Somewhere Over The Rainbow’ when you open the lid. All this wonder and we haven’t even got to the food. 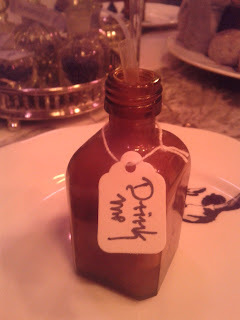 In keeping with the Alice theme, a miniature glass bottle, labelled ‘drink me’ serves up three layers of flavour: passion fruit jelly, coconut pana cotte and an exotic foam; marshmallow mushrooms, carrot meringue, mini clock face Victoria sponges and giant white chocolate encased mango mousse tear. Divine. Scones, sweet and savoury, exquisitely presented sandwiches, (thin strips of bread rolled up) and a jelly trolley, serving extremely fruity gelatinous delights round things out. 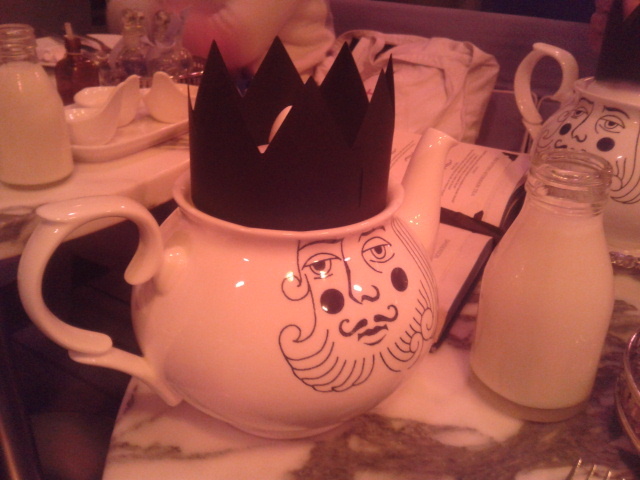 The tea is served at the Sanderson’s outdoor Courtyard Garden. Under cover with heaters, trees, fountains and candlelight when it gets dark, it’s a suitable wonderland. Tea available from 11am-5,30pm. £35 or £45 with a glass of champagne. Fancy a Christmassy stroll along the Southbank? Time it so you either start or end your walk at Embankment and enjoy the Royal Horseguards hotel festive afternoon tea. Served up in its cosy lounge, complete with Christmas tree and festive garlands, afternoon tea at this hotel is the perfect way to thaw out after London shopping. Its Indian spiced chai tea, with Ceylon and aromatic spices, creates a "teatotal" mulled flavour and is the perfect winter warmer. For ultra relaxation, a harpist even plays some dates. Pastry chef Joanne Todd is known for her creativity and willingness to change what’s on the menu and while scones and finger sandwiches will always figure, Todd is also adept at changing up the menu with seasonal afternoon teas covering everything from Halloween to Wimbledon and the Queen’s Jubilee. Savoury mini bacon muffins with melted cheese on top and choux pastry filled with egg mayo are welcome savoury extras. 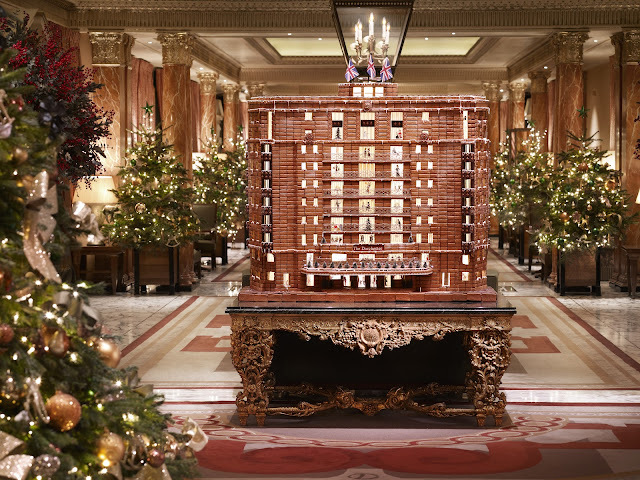 The daddy of Christmas-hued afternoon teas, the Dorchester doesn’t just serve up Christmas pastries and mince pies, but carols too. Its, admittedly pricey, weekend teas are served up to the accompaniment of a local school choir singing carols. To cut the cost and Aled-Joneses in the making, go for a weekday tea. Start things off with the Dorchester champagne and turkey, cranberry and sausage meat stuffing sandwich. Among others. Extra sweet treats (definitely not to eat) this year include a Gingerbread Hotel (pictured above), made out of 2000 individual pieces of gingerbread, constructed by the Dorchester’s pastry team and measuring 5.5” wide by 4.5” tall. It has nine floors, six replica balconies and even includes the hotels famous front doors. A ‘sweets in the City’ emporium meanwhile is perfect for children and sweet tooths alike; chocca with giant lollipops and chocolate coins and retro sweets, such as flying saucers and dolly mixture. Christmas carol afternoon tea on 15 and 16 December and 22 and 23 December at 2pm and 4.30pm. £64 per adult and £35 per child. Limited availability and can only reserve over the phone. Call 020 7319 7147. Festive afternoon tea until 1 January 2012 at 1.15pm, 2.30pm, 3.15pm, 4.45pm and 5.15pm. £51. Until recently, my knowledge of all things Peruvian amounted to one solitary reference point: a scruffy brown bear named Paddington who had a penchant for marmalade sandwiches. However, I'm happy to report that, thanks to a recent influx of new restaurants in London, that list (it's a list when there's more than one, right?) now has a new addition: Pisco. Pisco, for those of you unfortunate enough not to have tried it yet, is an aged grape-based liquor from deepest Peru, much like my aforementioned teddybear friend. 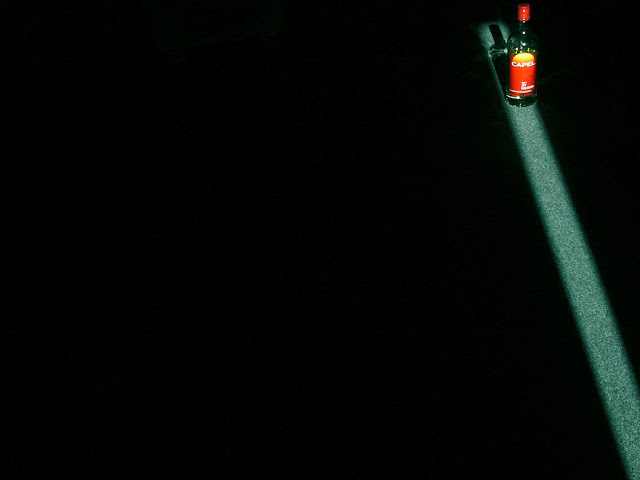 Once distilled, it is often infused with fruit or flavourings dropped artistically into the storage jars in a Damien Hurst-esque style. 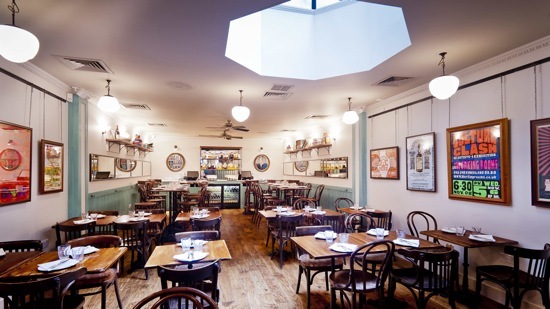 Head to Ceviche restaurant (pictured above) on Soho’s Frith Street to see them lined up in all their glory, with nine infusions including divine fruity options (apricot, cherry, physalis), the unique (eucalyptus leaf, cinnamon bark) and the downright dangerous (a hot peruvian chilli pepper – not for the faint hearted!). When it comes to Pisco-based cocktails, the stalwart and my firm favourite is a Pisco Sour; a blend of traditional Pisco, lime juice, sugar, egg white and bitters. Try it tangy and tart, you won't look back. 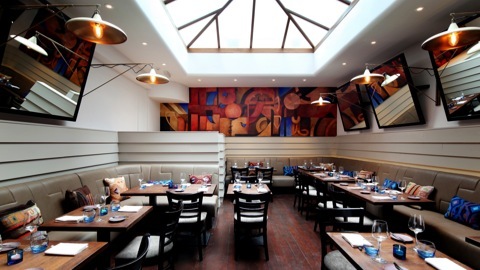 The new crop of Peruvian restaurants across London has brought a new range of Pisco cocktails, the best of which can be sampled at Lima restaurant (above) on Fitzrovia’s Charlotte Street. Try the Kantuta if you fancy something fresh and virtuous (cucumber infused Pisco with beetroot juice and agave syrup), or indulge in the Pia instead of dessert (vanilla infused Pisco, banana, crème de cacao, Frangelico, cream and egg yolk – it's naughty but oh so nice). After something more daring? The Cuento del Diablo looks every bit as devilish as it tastes: chilli infused Pisco, Cointreau, strawberry juice and lime, with a devil horn of chilli wedged to each side of the martini glass. Pisco bottle image courtesy of Flickr user J Pod (Share Alike). Ceviche image courtesy of Paul Winch Furness.